These petite bedrooms and playrooms prove good things do come in small packages. Take a peek at our editor's favorite modern kids’ rooms from the Dwell community this week. Because back-to-school shopping is an all-ages affair. When designing a bedroom or play space for your growing child, let your imagination run wild to encourage learning and curiosity. Guaranteed to radiate positivity, these fun pieces will easily make your kid's room come alive, while also enhancing your little one's creative spirit. 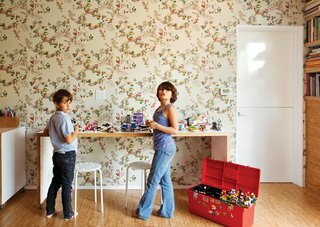 These colorful, light-filled bedrooms and playrooms are fun-sized design inspiration. Our editor's top picks of the week feature creative kids' rooms that spark the imagination. Many parents find themselves constantly searching for creative and well-designed building toys for their children. 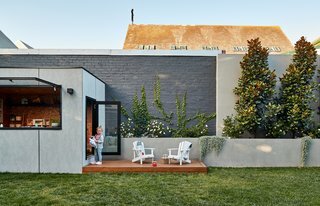 The fast pace of 21st-century living can sometimes make kicking back and having fun a challenge, even in your own home. Can a home that encourages creativity, exploration, and fun still look grown-up? If you have infants or toddlers in your home—or are about to have a baby—consider childproofing your living space to reduce the risk of accidents or laborious cleanups. Summer is all about experiencing simple pleasures. With just under two weeks away until Father’s Day, it’s the perfect time to get down to business and figure out what to get for the man in the spotlight. With Mother’s Day right around the corner, you still have a few days to find the gift your mother will remember for years to come—but you have to act fast! The four structures that form Studhorse in Northern Washington encourage family members and guests to interact with the landscape—and form lasting memories with each other. Playgrounds have followed the same architectural playbook since they premiered in the 19th century—a few swings, a slide or two, and maybe some monkey bars. When investing in a nursery, think big picture and look for pieces that have the potential to go above and beyond your child's immediate needs. Designing a home is a big commitment. An even bigger commitment is deciding to grow your family. Making the most of a little spare loft space can add a whole new dimension to your home. Here are a few creative examples. Babies happen. They can even happen in a modern home. Designing kids rooms can be fun, but it’s always challenging. One of the biggest concerns expecting parents face is having enough space! An inventive, freestanding “tree house” built by an architectural designer for her family grows in Garrison, New York. A baby's arrival is cause for celebration—and for many, it's also a time to confront limited living space. Our suggestions encourage curiosity, creativity, and play.